Gordon Andrews has posted a new snippet from Magic Bleeds and this one is from Curran’s POV. The Book Vixen is asking a great question – who owns our reviews? Honestly, I don’t see how a book review is any different than a news article or editorial piece. So we totally own our reviews. What do you guys think. A signed copy (and bookplate) of Song of Scarabaeus by Sara Creasy. Contest ends tonight! Two copies of Cheat the Grave (signed) and City of Souls to four different readers! Contest ends June 1st. Vampire Wire is giving away a copy of Shana Abe’s The Treasure Keeper. Contest ends June 9th. All Things Urban Fantasy has another fabulous list of ongoing contests right – a total of 128. 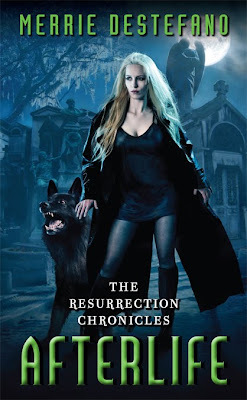 Vampire Wire is giving away a copy of Keri Arthur’s Moon Sworn. Contest ends June 6th. Thanks so much for posting the cover for my book, AFTERLIFE! I really appreciate it. And yes, Tez is fantastic when it comes to knowing about all the new releases. I think she’s secretly superhuman. I love your site! Keep up the great work!